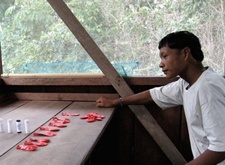 A Pirahã man participates in a new experiment that, researchers say, indicates that his language contains no number words, even for the number one. The Piraha people, a tribe in the Amazon, gives insight into how innate a ‘taoist’ approach to life may actually be, and that the human mind has just become a little sidetracked of late. Of late, meaning the last 10,000 years or so. For an overview, see Don’t Sleep, There Are Snakes: Life and Language in the Amazonian Jungle by linguist Daniel Everett. Members of the Pirahã tribe participated in an experiment that researchers say indicates that their language contains no number words, even for the number one. Talk about living in the moment! The author of the book, Daniel Everett, was a missionary who went to proselytize to members of a remote Brazilian tribe, and eventually became a full-fledged linguist. This tribe has no creation myths or storytelling traditions. They live in the present and believe only in what they and their comrades directly observe — a cultural characteristic that lead Everett to abandon his own faith. Need I say more? For more, see this Science News report, Numbers beyond words, which discusses how this Brazilian group grasps exact quantities without naming them.